Allows start with the best ingredients. 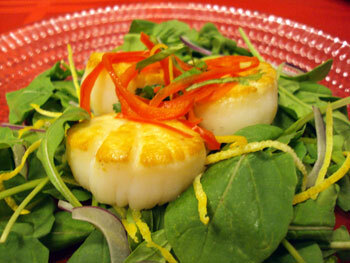 Dry pack Scallops are not pumped with water and chemicals so they do not shrink when cooked. As scallops will brown faster if they are not too crowded in the pan, it is a good idea to do them in two batches. Melt 4 tablespoons of the butter in a large, heavy skillet; sauté half the scallops over moderately high heat for no more than 4-5 minutes until the edges are lightly browned. Keep these warm while you cook the remainder. Melt the rest of the butter sauté the second batch of scallops. Sprinkle with salt and pepper; serve at once with lemon wedges. Simple to prepare and simply wonderful to devour.